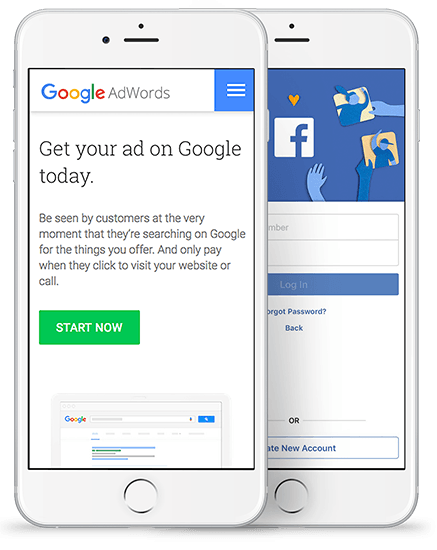 Target new customers and generate new leads with Google AdWords, Facebook Ads and other advertising platforms. Paid advertising is a great way to attract immediate customers. Paid advertising is highly effective in increasing your online exposure and generating traffic to your website. If you’re looking for consistent and immediate traffic, paid advertising can help your business. Make Google AdWords part of your marketing strategy. As part of your internet marketing strategy, we recommend a healthy balance of organic and paid search results through Google AdWords. Your campaign can be finely targeted and formatted to engage new customers. Let us manage your Google AdWords campaign and help you make the most of your investment. Drive more traffic to your website with banner advertising. Banner Advertisements are a form of online advertising that contain text and images about your business, products or services. We create banner ads designed to catch attention and effectively communicate your brand. Bring visitors back to your website with remarketing. When browsing the web, you may notice websites display advertisements relevant to one of your previous searches. This is called remarketing. We can take advantage of this technology to help target and engage people that have visited your website. Our competitors may focus on web design, Google AdWords or social media alone. We’re different. We make it work together to reach your business goals. This means you deal with one company for your website, search engine optimisation and social media marketing needs.